The question is from the topic circles and polygons.It discusses about the ratio of circumference of circle to the polygon that is inscribed in it. CAT Geometry questions are heavily tested in CAT exam. Make sure you master Geometry problems. Question 35 : There are 2 concentric circles, one big and one small. 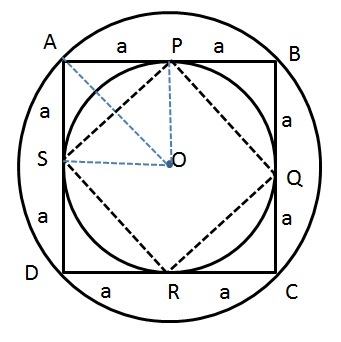 A square ABCD is inscribed inside the big circle while the same square circumscribes the small circle. The square touches the small circle at points P, Q, R and S. Determine the ratio of circumference of big circle to the polygon PQRS. Method of solving this CAT Question from Circles: Finding out what shape is PQRS and assuming the side of ABCD to be 2a will help to get further answer! Let the side of the square ABCD be 2a. Therefore AP = PB = a. Similarly for other sides too. From the above we can conclude that PQ = QR = RS = SP. Therefore PQRS is also a square. Now we have to find the side of square PQRS. The question is "Determine the ratio of circumference of big circle to the polygon PQRS."